OF all the harrowing days the West Indies have endured on the Test grounds of the world over the past couple of decades, and, heaven knows, they have been plentiful and persistent, none were as horrific as the two and a half it took to capitulate to Australia in the first Test of the series in arctic Hobart. Australians were sensible enough not to expect a competitive challenge. Recent results alerted them to the situation. The team’s loss by 10 wickets to an anonymous Cricket Australia XI in their solitary lead-up match immediately justified their media’s proposal, impractical as it was, for switching the showpiece Tests in Melbourne and Sydney, assigned to the West Indies, for palpably stronger New Zealand. Yet they couldn’t possibly foresee just how limp the West Indies would be at the start of a contest, offering them the chance to at least restore a little of their tarnished reputation. 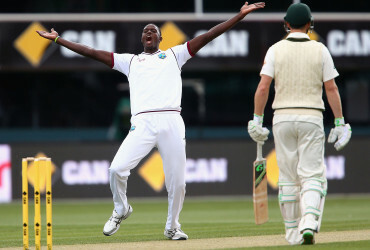 As Jason Holder slowly and ruefully trudged back to the pavilion after his second innings dismissal on Saturday, to a leg-side tickle to the keeper, it was the first sign that the pressure after defeat in his first three Tests at the helm, two by an innings, was impacting on the young, inexperienced captain. 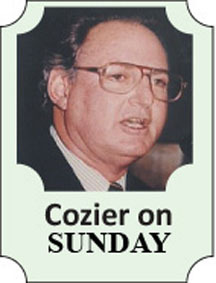 He referred to the glaring lack of support for Holder from senior players, those “who need a kick up the backside.” There were no prizes for deducing that those he had in mind were Marlon Samuels, a talented, underperforming batsman in his 15th year of international cricket, and Jerome Taylor and Kemar Roach, the new ball pair with 77 Tests and 250 wickets between them. Samuels loitered around the outfield in Hobart, showing little interest in the proceedings. His fingers on both hands were taped so that he resembled a version of some Egyptian mummy. Occasionally, he donned his designer sunglasses, occasionally he broke into a casual trot in pursuit of the ball. Taylor, the same bowler who started his previous Test against the same opponents on his home ground of Sabina Park in Kingston in June, with five consecutive maidens and two wickets, and Roach, well down in pace from his trip down-under five years earlier, each got the series underway with a no-ball, first up. David Warner and Joe Burns picked off their listless offerings over the first eight overs for 12 fours in 58 runs. The die had been cast. The only sparks for the West Indies after Adam Voges and Shaun Marsh had amassed their record partnership and seen Australia to 583 for four before Steve Smith mercifully declared, were Darren Bravo’s delightful first innings of 109 and Kraigg Brathwaite’s uncharacteristically belligerent second innings 94 out of 148. A raft of post-mortems has inevitably followed yet it remains difficult to foresee where to next for West Indies cricket. The most feasible, if disturbing, answers point to a split into the separate territories that have banded together for over 100 years or else its inevitable demise in Tests with concentration solely on the shorter, white ball formats. Tom Moody, a former Australian player, is now the director of the T20 Caribbean Premier League (CPL). He believes its popularity over its first two seasons can be the catalyst for reviving diminishing public interest in the game overall. Whether those who fill the stands wherever the CPL is played are there for the cricket or for the off-field entertainment under lights is a moot point. Even before a ball was bowled in Hobart, Baldath Mahabir, a director who quit the “unprofessional, tardy, lax” West Indies Cricket Board (WICB) last month, spoke of his concerns that there may be no such thing as West Indies cricket within 10 years. Mahabir maintained that the present generation in their 20s would have no recollection of the heady times when the West Indies ruled the world. All they know is an entity that languishes near the bottom of the International Cricket Council (ICC) rankings for a couple of decades. His concern is that young fans increasingly favour supporting their individual territories, rather than enduring the embarrassment of the West Indies’ constant defeats. Six years ago, Darren Ganga, then Trinidad and Tobago captain who had 48 Tests for the West Indies between 1998 and 2007, made a similar point. There is no such political entity as the West Indies. Its shareholders – Barbados, Guyana, Jamaica, Leeward Islands, Trinidad and Tobago and the Windward Islands – are all fully independent mini-nations with their own governments, currencies, flags and anthems. It is a wonder they have held together for over 100 years, since a 1900 tour of England. That unity has become increasingly fragile. More than one player now unavailable through their commitments to global T20 franchises have told me they feel the West Indies they would officially represent is really the WICB. It is an interesting perspective prompted by the mutual lack of trust between the two. Shortly after Ganga’s comments, the Trinidad and Tobago Cricket Board (TTCB) boycotted the annual general meeting of the WICB. Then president Deryck Murray, the former West Indies wicket-keeper and vice-captain during the glory days in the late 1970s, acknowledged that it was a difficult decision. Six years later, nothing has changed, in spite of three commissioned reports that have recommended extensive adjustments to the structure of the WICB. Murray was a member of the latest, mandated by the Caribbean governments, that is being discussed by the WICB’s quarterly meeting this weekend in St Lucia. It calls for the board to be immediately dissolved, all its members resign in favour of a new board with wider, more varied representation. Predictably, the WICB is strongly resisting the recommendation. The Caribbean and Tasmania are as far apart as the disenchanted players are from the WICB. The results in the board room in Castries and on the field in Hobart are closely related. In the meantime, Holder and his players have a two-day match against a Victorian XI as preparation prior to the daunting Boxing Day Test at the Melbourne Cricket Ground followed by the final match in Sydney early in the new year. They need to stir themselves into a stronger showing than their obliteration in Hobart; if they don’t, West Indies might well be wiped off future ICC Test itineraries.